It is Mother’s Day and every one wants to give you a hug, a kiss, a card, so on and so forth. But what is it that you really want? No, what is it that you really, really want? As a young mother of two I would really love to get my body back into shape. You know, that body that doesn’t look like a baby making machine. 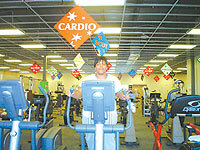 And Victory Lady Fitness Center, just the place to make that happen, has moved into the neighborhood! I stopped in at the new Victory Lady at 3915 N. Richards St. in the new retail strip construction next to Wal-Mart. I asked one of the co-owners, Dawn McDermid what makes Victory Lady unique. She told me the company is privately owned and operated and for ladies only. She claims that they’ve been “Milwaukee’s Premiere Health Club for eleven years.” The center has a personal training program. In the beginning you and your trainer determine if you are training to lose or gain and what it is going to take to help you reach your goals. They offer Circuit Training and Group Fitness Classes at rates that don’t put a strain on a sistah’s pocket. Classes include Cardio Kick Boxing, Jazzercise, and Yoga. Victory Lady claims to be the only Fitness Center in Wisconsin that has the Matrix, an exercise machine that works out every part of your body at once. My hips, my thighs, and my arms. Yeah!!! Ladies, you are beautiful at any size, but when you are ready to go up or down a size, Victory Lady seems like a wonderful and friendly place to make that happen.